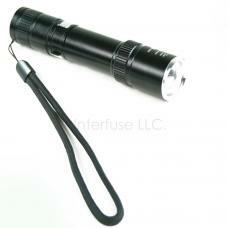 A high-quality metal LED flashlight powered by one 18650 battery (not included). The light can be used in three different modes, high beam, low beam, and flashing. It also features zoom and focus capabilities allowing you to use it as a flood or spot light. We offer lightning fast shipping to all customers in the lower 48 states!